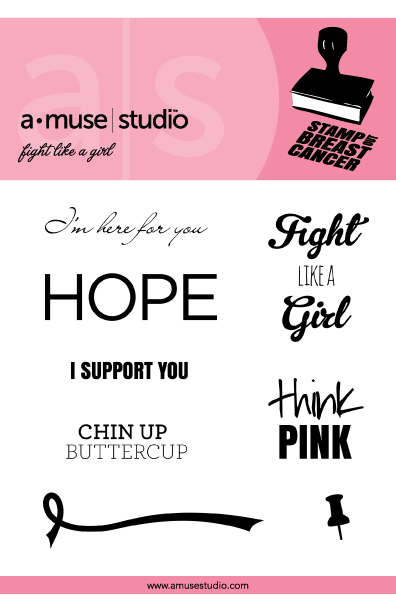 October is Breast Cancer Awareness Month and a few years ago, I got this wonderful "Fight Like a Girl" stamp set from Amuse Studios. Most of the images can be used for any type of Cancer Awareness and it is one of my Go-To stamp sets. I received so much support this past year when I went through my Thyroid Cancer diagnosis and treatment. It meant the world to me and I love paying it forward by supporting others who are fighting their own battles. I decided I wanted to have a giveaway this month and offer the set to one of my blog commenters/followers.When I contacted my friend, Chris Franco to see if the stamp set was still available, she was kind enough to offer the set to my winner. Amuse Studio offers this stamp set for only a $3 shipping fee and also has free printables and a calendar. There is also a ribbon die available to purchase that matches the ribbon stamp in the set. They are all available here. I have no affiliation with Amuse Studio at all.Just wanted to offer you a chance to have this fabulous set for your own. Thank you so much to Chris for her kindness. And to Amuse Studio for such a fantastic stamp set. I started out with my favorite Kraft cardstock card base and placed some pink floral washi along the top edge and a strip of pink glitter washi down the left side. They are both from the Recollections Tea Party collection. I covered a chipboard tag with a piece of Hello Love patterned paper by Crate Paper. After stamping HOPE with Memories Black India ink, I placed several pink and silver sequins on the tag. THINK PINK was stamped using Pixie Pink ink by Stampin' Up and punched out with a square punch. I adhered it to the edge of the tag then stamped the cutest pushpin stamp on the tag/edge of the THINK PINK image. The HOPE image was adhered to the Kraft card base using Scotch Pop-up Foam squares. I will choose 1 random winner on Sunday, October 16. So please comment on this post and sign-up to follow my blog. You will love this stamp set as much as I do. I appreciate you taking the time to visit Meticulosity. There will be another Think Pink card later this week using another amazing stamp set. So kind of you to share, Deb. This stinky disease needs a cure already! Lovely card! I have that same stamp set, I always forget about it! Love the kraft card stock with all the pretty pinks! I am going to a funeral service today for a stamping friend - I HATE cancer. :( Thanks for helping get the word out and thanks for the shout Deb! I get your blog thru e-mail. Always enjoyable. they did find a lump and she fought for 5 or 6 years - with it spreading from one thing to another - but it eventually got her. It's an insidious disease. take care. Hello Beautiful! I am now both a follower and follow by email (which I love because I will never miss another post...smile). What a wonderful idea and what a versatile stamp set.... Glad I can participate... Happy October sweetie! I would love this!!! Thanks for the opportunity! Beautiful card, so important to keep telling this. I'm here only to comment on your generosity and wonderful card, not to enter the giveaway. :) we've talked about how much we both hate the awful 'c' word, so I'm behind you all the way in your support of all who have had to endure the dreaded diagnosis. you are amazing! Fabulous stamp set! Thanks for the chance to win it! Love this giveaway!! Pink is a great color this month! My hometown dyed the park's fountain water pink! Thanks for the chance to win. Lorelei Campbell, survivor!